Q1: What is Laser Hair Removal? Laser hair removal is the use of laser energy to produce permanent hair reduction. 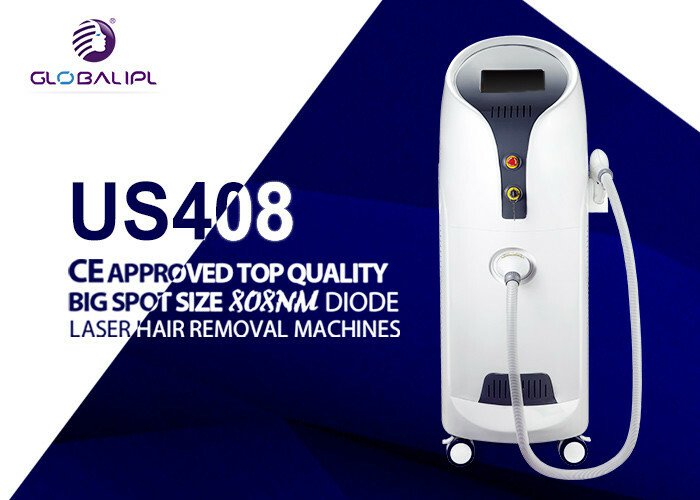 The 808nm diode laser emits energy that is absorbed by the melanin pigment, resulting in rapid heating of the hair follicle. The heat destroys the papillae (hair follicles) that are responsible for the hair growth. Over multiple treatments, you can achieve permanent results. Melanin determines the pigment of your hair. Depending on the mixture of the two types of melanin --‐ eumelanin and pheomelanin --‐ your hair will be dark or light colored. The process of laser hair removal works by directing the laser onto the skin, where the laser's high--‐energy light becomes absorbed by the melanin located within the hair follicles. Once absorbed, the light transforms into heat, eliminating the entire part of the follicle responsible for the growth of new hair. Q3: What does "Diode" mean? Q4: What are the advantages of the Laser Hair Reduction device? 1)It is CE Certified, meaning it meets the health and safety requirements set out in International Directives. 2)It is easy to use, simply turn it on, adjust the skin type (I-VI) and begin removing unwanted hair. 3)It can be used in the comfort and privacy of salon/spa/clinic; permanently reduce hair on your schedule. 4)The technology used has been proven to be over 90% effective for permanent hair removal by leading research institutes and universities. 5)It is the most economical solution when it comes to permanent hair reduction. You will save thousands on salon treatments and products. Q5: Is there anything I need to do/not do prior to treatment? As the laser targets the root of the hair, do not use any hair removal methods that remove the root (such as waxing) within 2 weeks prior to treatment. Shave or clip the hair in the area you wish to treat. We also highly recommend applying the Cooling Gel approximately 2-3 minutes prior to laser hair removal treatment. Q6: Can I use the laser on sensitive/private areas? Any area, except the area adjacent to the eye, with excess hair can be treated with Diode Laser. The most common areas are the face, upper lip, neck, chest, underarms, back, abdomen, bikini line, and legs. To avoid potential injury, exercise caution when using laser hair removal on facial area. Q7: Do I need to wear protective goggles/eyewear? It is highly recommended to wear protective eyewear when operating any laser device. Professional glasses and goggles are usually sufficient eye wear protection, however even while wearing glasses you should avoid direct exposure to the laser as 100% protection is not guaranteed. 1.Choose us, you needn't worry about the ability of supplier. Our company is established since 2003,over 15 years Production Experience of Beauty machine all of the R & D team are Master's degree or above.Annual sales of our beauty machines are over 1000 units, and also our customers are all over the world more than 200 countries. 2.Choose us, you needn't worry about the quality of products. Our production process is according to ISO13485 standards strictly,Has obtained TUV SUD ISO13485 quality management system certification. 3.Choose us, you will get the feel service as family. Our salesman have the experience more over 10 years. Our language service are including English, Russian, Spanish, Arabic and others, all of them are professional . We offer 24*7 hours online services, It's better to answer your questions as soon as possible. 4.Choose us ,you needn't worry about the packing and shipping problems. We use aluminum case to pack the machines which is the most safe and convenient. In addition, we are VIP of DHL Express which provides fast door to door service with best discount prices. Besides, we provide also shipment by air, by sea, by truck, or any other shipping methods according to customer's demand.